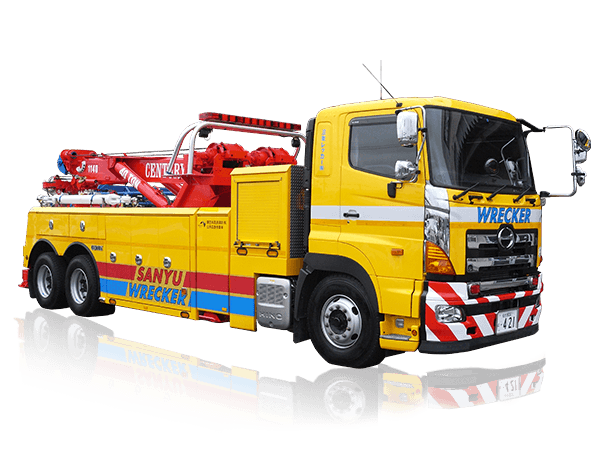 Yamaguchi Wrecker has been providing sophisticated, high-precision tow cars and transportation vehicles to the market. Our vehicles created by a lot of practical experiences are reflecting the technology with the strength of Yamaguchi Wrecker in all details. We are continuing constant innovation. Please look forward to what we will provide next along with U.S. Miller Industries, Inc.
Holmes 440PT type tow truck system became the announcement to leave the 28th May , but, in fact, a prototype machine was coming to Japan in the fall of last year already . It is the Yamaguchi news after a long time . I go to Miller headquarters in Chattanooga, Tennessee several times a year , but the way we will stop several times to the small town America of a certain . I m coming now . m A really remote countryside cell-phone reception as well , such as not getting through is a good treatment that can have a relaxed time in Chattanooga as well . In the economy is not well never wave of exhaust emission regulations for diesel vehicles has surged in the United States like Japan , the impact seems to come out quite well in cargo movement of tow equipment . The production of domestic large tow only in Japan. I will stick to quality and safety.